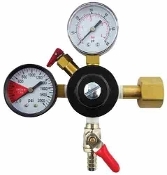 Dual Gauge CO2 Regulator. Hi Pressure gauge reads 0-2000psi. Low pressure gauge reads 0-60psi. 1/4" Barbed ball valve with check, and one washer included.